^ Adeleye, Gabriel G. (1999). World Dictionary of Foreign Expressions. Ed. Thomas J. Sienkewicz and James T. McDonough, Jr. Wauconda, IL: Bolchazy-Carducci Publishers, Inc. ISBN 0865164223. ^ Kollega Tarsoly, István (编). 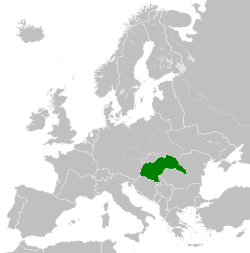 Magyarország. Révai nagy lexikona. Volume 20. Budapest: Hasonmás Kiadó: 595–597. 1995. ISBN 963-8318-70-8 （匈牙利语）. ^ Kollega Tarsoly, István (编). Magyarország. Révai nagy lexikona. Volume 21. Budapest: Hasonmás Kiadó: 572. 1996. ISBN 963-9015-02-4 （匈牙利语）. ^ "New Twist to an Old Riddle: The Bombing of Kassa (Košice), June 26, 1941". The Journal of Modern History (The University of Chicago Press) 2 (44).